Another year, another batch of superhero films centered on white men. With the X-Men franchise pushing its female characters further and further into the background, Scarlett Johansson’s Black Widow is the most prominent female lead in a major superhero franchise. And she’s never even fronted a film herself. Even as female protagonists make inroads into sci-fi and action films, they’ve remained largely shut out of the superhero movie craze launched by Bryan Singer’s X-Men, legitimized by Christopher Nolan’s Batman trilogy, and revolutionized by the Marvel Cinematic Universe. That’ll all change in the next few years as various studios finally bow to pressure and start making female-driven superhero films. DC made headlines when it announced plans to release a solo Wonder Woman film in 2017. Marvel quickly countered with an official 2018 date for a movie centered not on the immensely popular Black Widow, but on Carol Danvers, a.k.a. Captain Marvel. Kate Mara will appear (and disappear) as The Invisible Woman in Fox’s Fantastic Four reboot while Sony is developing a female-driven Spider-Man spinoff. These projects are still a few years away, but they’re a beacon of hope for fans who have long been demanding female-driven projects that are better than 1984’s Supergirl, 2004’s Catwoman, or 2005’s Elektra. After all, it’s rather disheartening that the best female-driven superhero film of 2014 was named after two men. Yet despite its male-centric title, Captain America: The Winter Soldier actually made fantastic use of Johansson’s spy/assassin Black Widow, a.k.a. Natasha Romanoff. Widow is essentially a co-lead for a good portion of the film and proves far more important than the mysterious Winter Soldier of the title. The film centers on Captain America, a.k.a. Steve Rogers (Chris Evans) settling into the 21st century world after the events of The Avengers. Cap and Black Widow start the film as uneasy co-workers at the massive counterintelligence agency, S.H.I.E.L.D. When corrupt forces infiltrate the organization, Steve and Natasha team up to take them down. Joss Whedon’s Avengers script paid particular attention to humanizing and deepening Black Widow’s character (first introduced in Iron Man 2), amping up her screen time, and positioning her as a crucial participant in the plot. Winter Soldier continues that trend. Widow isn’t there to teach Steve a lesson, get rescued by him, or grow under his influence. She’s an independent player whose motivations are explored almost as much as his. As an ex-KGB agent turned American spy, Widow is troubled by the realization that S.H.I.E.L.D. might be as corrupt as her former employers. She joins up with Cap to reaffirm her inner morality and seek vengeance for a fallen mentor. Her espionage skills prove as useful as Captain America’s physical strength, especially when the duo goes incognito. By her third appearance in the role, Johansson is a master at capturing Widow’s dry wit and hidden vulnerabilities. Her real-life friendship with Evans translates into an easy chemistry between their characters, which largely carries the second act of the film. Winter Soldier smartly avoids shoehorning in a romance between Steve and Natasha. Instead, it’s Anthony Mackie’s Falcon who fulfills the narrative beats of a Steve Rogers love interest. In contrast to Black Widow’s nuanced motivations, Falcon joins the climatic battle simply to be around Steve. Even as its films deepen the character, the marketing side of Marvel Studios continues to treat Black Widow like a sidekick. She’s often absent from merchandise and deemphasized in advertising despite the fact that she’s a wildly popular character. 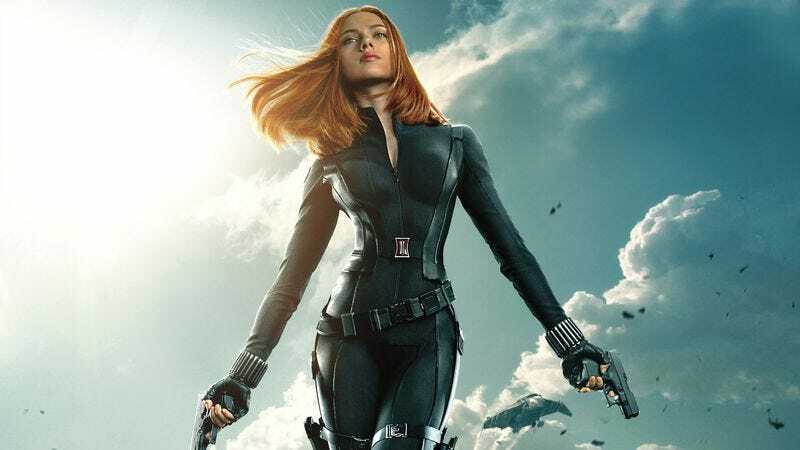 Although Marvel Studios president Kevin Feige pays lip-service to her importance, he also claims he’s not interested in making a Black Widow solo film because she works better on a team. Of course, the fact that Captain America is also great on a team hasn’t stopped Marvel from centering two films on him. But unless Feige changes his mind, it looks like Black Widow will be stuck playing an increasingly compelling second fiddle in the Marvel Cinematic Universe. But Black Widow wasn’t the only morally ambiguous woman to take a back seat to a male character in 2014. Both X-Men: Days Of Future Past and Guardians Of The Galaxy featured similarly conflicted female assassins. But while Jennifer Lawrence’s Mystique and Zoe Saldana’s Gamora are fascinating characters, they’re largely denied the autonomy that makes Black Widow’s arc so satisfying. On paper, Mystique and Gamora are crucial to their respective films. In Days Of Future Past, Hugh Jackman’s Wolverine travels back in time to stop Mystique from committing a history-changing assassination in the name of mutant rights. But Mystique exists mostly to dramatize the ideological rift between peaceful Professor X (James McAvoy) and radical Magneto (Michael Fassbender). The film is clearly interested in the two men battling over her soul, but it largely ignores the story of how the naive Mystique we last saw in X-Men: First Class became the calculated agent in Days Of Future Past. Mystique may get a lot of screen time, but she ends up feeling like a pawn, not a player, in the struggle between two men. Similarly, Guardians Of The Galaxy’s Gamora exists mostly to help the audience track the character development of Peter Quill (Chris Pratt). We understand he’s becoming a better person because he stops treating Gamora as an object and starts treating her like a human being. Unfortunately, with Quill as its focus, there’s little time to explore Gamora’s compelling history. She was kidnapped and forced to work as an assassin by a cruel father figure named Thanos who just happens to be Marvel’s biggest bad guy. Meanwhile Gamora’s half-sister/nemesis, Nebula (Karen Gillan), serves as a lower-level baddie. Theoretically, Gamora’s desire to keep an all-powerful orb away from her evil family drives the film. But instead of centering on her fascinating and relevant familial drama, the film inserts a tragic backstory for Quill and largely pushes Gamora to the side. Both Days Of Future Past and Guardians strive to give their female characters a sense of independence, but drop the ball when it comes to exploring their inner lives. The characters are fascinating, but ultimately get lost in the shuffle. That’s always a danger with large ensemble films—Days Of Future Past’s Beast and Guardian’s Drax are similarly underdeveloped—but Mystique and Gamora bear the added burden of representing an underserved demographic. If superhero films started populating their worlds with multiple female leads, it would be much less problematic if one or two are shallowly drawn. I’m overjoyed that female-fronted superhero films will theoretically be here in two to three years. But that doesn’t mean we should stop demanding more from an industry that already has six films centered on a white guys named Chris and 11 on millionaire playboys. In addition to a Captain Marvel movie and a Black Panther movie, Marvel’s docket includes eight films centered on white men. D.C.’s Wonder Woman announcement also came alongside a slew of male-driven projects. Why are superhero studios so timid when it comes too diversifying their worlds? Female-led blockbusters like Hunger Games, Lucy, Maleficent, and Divergent are regularly dominating at the box office. And given that Marvel can turn a talking raccoon and an anthropomorphic tree into household names, we’re well past the point of worrying that audiences won’t show up for female-fronted superhero films. Fox and Marvel have the opportunity to give Mystique and Gamora the attention they deserve in the upcoming X-Men: Apocalypse and Guardians Of The Galaxy 2. In fact, there’s nothing stopping the studios from positioning those ladies as the protagonists of their respective sequels. It remains to be seen how big of a role Black Widow will play in the upcoming Avengers: Age Of Ultron and the subsequent Avengers: Infinity War films. Regardless, I would argue there’s plenty of room in the Marvel Cinematic Universe for both a Captain Marvel movie and a Black Widow movie. (Johansson, fans, and screenwriters all seem to agree.) With this summer’s Lucy, Johansson proved more than capable of turning an R-rated, non-franchise action flick into a blockbuster that earned triple its budget. Part of the reason the film did so well was its ability to attract female viewers, who made up half of the film’s audience. (Marvel, on the other hand, has only ever reached an audience that’s 44 percent female.) Between the character’s existing fan base and viewers specifically seeking out female-led projects, a Black Widow solo film has every chance of becoming Marvel’s biggest hit yet. Of course, the assumption I’m making is that increasing representation is a good thing. And while that’s a belief many people hold, others argue that storytelling should be more important than quota filling. But those two things aren’t mutually exclusive. What makes the Marvel universe so great is its range of characters—from rich, selfish Tony Stark to mild-mannered Bruce Banner to godlike Thor. Adding more female superheroes and superheroes of color will expand storytelling possibilities, not limit them. Here’s a quick thought experiment for those who think representation doesn’t matter: Imagine a world in which the only superhero films starring men were Superman IV, Batman & Robin, and Daredevil. Wouldn’t you be demanding better representation too?